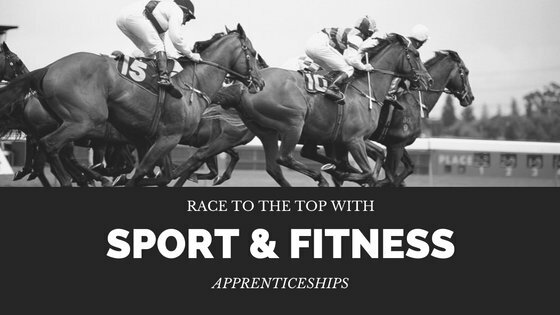 Becoming a sport and fitness apprentice might be about being active and helping other people get (and stay) fit, but there are lots of other opportunities as well. They could be at the facilities we use to keep in shape, the stores we buy our equipment, or even in the outdoor spaces we visit when we’re taking part in various active pursuits. There are a whole lot of sports out there so naturally there’s a range of Apprenticeships to match. You could aim for an activity leadership programme, be an exercise and fitness / personal training apprentice or follow the leisure operations and management path, for example. The sport and fitness industry team is a big one, employing more than 600,000 people across 230,000 organisations across the UK. You don’t have to be a football fanatic or gym geek to get a winning career from sport: we’re talking about physical activity and wellbeing in general, not just the competitive stuff that gets us shouting at the TV. If you want to work up a sweat and help others reach their goals and get fit, you can absolutely do that as a fitness instructor, coach or activity leader. You might be based in your local leisure centre, a private gym or perhaps a spa, working with individuals and groups on a daily basis; or you could set up on your own as a personal trainer. The various places we exercise and the sporting events we attend don’t run themselves, either, so if you’re not preparing people to compete or getting them fit you might be assisting at matches or working in a range of leisure facilities to make sure they run smoothly. That includes keeping anyone watching safe, or perhaps making sure everyone in your community has access to sport and physical activities, no matter what their physical condition. Less sweaty but no less important are the front of house and behind the scenes jobs. They include things like reception desks at gyms and leisure centres, or working in an office dealing with the admin side of things, whether that’s organising a netball tournament, ordering equipment or managing the membership of your local gym. You don’t need to be an athlete to have a successful career in this sector. If you’re planning on being a personal trainer or working with professional sportsmen and women you probably will need to be in decent shape (get started on those pressups), but that’s just one path available to you; there are many others. The more general skills you’ll need include getting on well with people: you’ll need to be a good communicator to motivate a spin class, recruit new gym members or work with reluctant children to get them interested in exercise. You’ll also have to have a good grasp of numbers if you’re working on the admin or more science-based side (or even if you’re keeping score during a cricket match). There’s lots of scope for development because you’ll constantly be improving and honing your skills. Plus, people are always going to want to get out and get moving, so you’ll have a constant stream of new clients and challenges. On the field or behind the scenes, the more experience you have, the more you’ll be able to move into senior positions, too. Even running a marathon begins with a single step. Take your first one towards a sport and fitness career by visiting careermap.co.uk to find out what’s available in your area, or skillsactive.com to find out more about the sector as a whole and the kind of jobs you could do. If you’d like to get involved now and give yourself the best chance of getting accepted onto an Apprenticeship, you could also consider volunteering with a local sporting organisation or charity. You’ll get some useful experience, make some contacts and hopefully make a difference to the people you work with. If you respond well to a really practical kind of training that involves learning by doing, an Apprenticeship could be the ideal option for you. Like all apprentices, sport and fitness apprentices split their time between working for an employer and receiving a salary, and studying at college through day release, night school or online learning. Depending on the job, there may be the chance to gain other qualifications as you progress through your career, too. Apprenticeships are offered by a wide range of employers. You might be working and training in the local branch of a nationwide chain of gyms, or in the private facilities of a luxury spa or golf course. Alternatively, you could be out in the community promoting healthy living, or at your desk taking care of admin for a sporting charity. Your day as a sport and fitness apprentice could start early, especially if you work in a gym or other leisure facilities where people like to go before work. It could also end late, as we like to play our games in the evenings – you’ll need to be OK with flexible hours and be prepared to travel. It depends very much on the path into sport and fitness that suits you best. An administrative role will probably stick fairly closely to office hours (around 9am to 6pm), usually Monday to Friday, and involve working with computers and learning to be a part of the office team. Teams of the sporting kind keep very different hours though, so if you’re out on the field, helping at events or preparing competitors to get out there, expect some antisocial hours: that means early mornings, late nights and putting up with every kind of weather. It wouldn’t be sport if you weren’t training at all hours, out in all conditions and pushing yourself (and others). That’s part of it. You’ll find yourself working with a lot of different people as well. In some roles you might be trying to find a coach for a community centre or trying to persuade people to donate to your charity; in others you’ll be persuading them to grind out one more rep or reach just a little higher on the climbing wall. Whatever you do, your Apprenticeship will stretch you, enhance your people skills and boost your technical knowledge on anything from the human body to swimming pool maintenance.